Somehow another year has passed and the return leg of the Jamaica exchange is upon us. 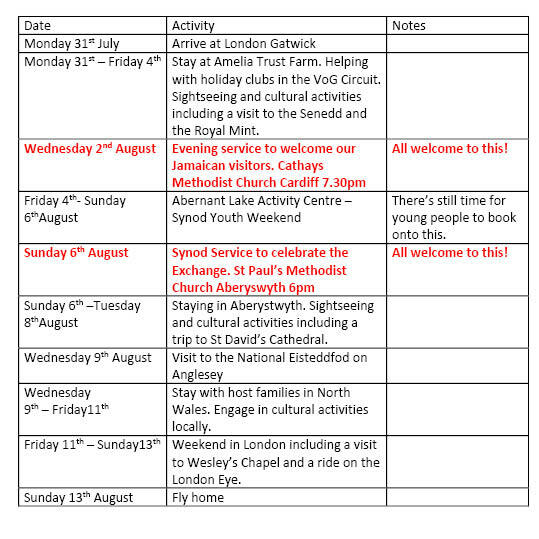 The information below will let you know where our visitors (accompanied by some of our Welsh exchange participants) will be and what they will be doing. I do this is for two reasons. 1. That you might pray for everyone involved and that all the events and activities would go smoothly. 2. To let you know that you are welcome to come and meet our visitors at various points during their stay. Other than the services (see below) just let me know when you are interested in coming so we can co-ordinate your visit. Please note the two special services. The first is at Cathays Methodist Church Cardiff on Wednesday 2ndAugust at 7.30pm. The second is at at St Paul’s Methodist Church, Aberyswyth on Sunday 6th August at 6pm . This entry was posted in News, Youth on July 27, 2017 by Lisa Medina.